A NORTH Korean ship banned from entering every port across the globe has disappeared from radar. What is the secretive regime up to? A NORTH KOREAN cargo ship caught up in UN sanctions disappeared from radar for a month before winding up hundreds of kilometres away going around in circles. The Hao Fan 6, a 140m vessel, was last tracked on October 10, the day it was banned from entering every single port in the world and punished for violating sanctions on North Korea. According to US broadcaster CNN, the ship disappeared off South Korea with its transponder pinging continuously until 11.17pm Coordinated Universal Time (CUT). A month later, Hao Fan 6’s signal was detected in the East China Sea, hundreds of kilometres away from its last location. The ship’s transponder was switched off for the rest of the month and according to one expert this isn’t entirely uncommon for vessels engaging in illegal behaviour. Transponders, a mandatory international requirement for large vessels, can be switched off during times of threat or when trying to remain undecked. 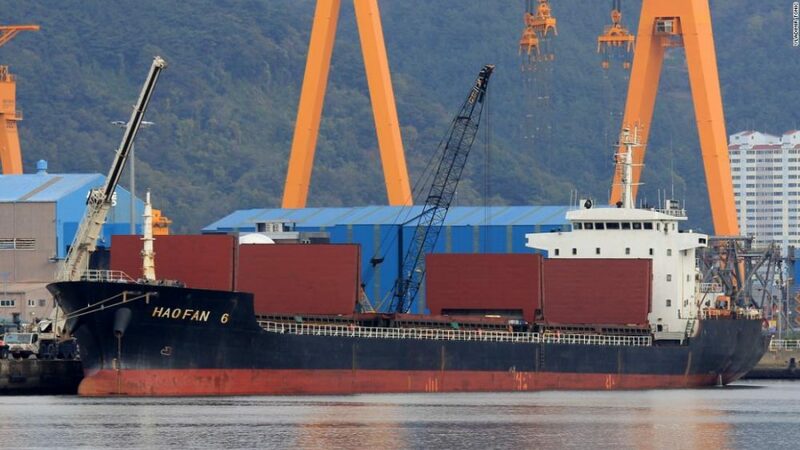 The Hao Fan 6, which is technically owned by a Hong Kong shipping company, was one of four ships the UN hit with global port bans and visited North Korea three times last year, stopping along traditional coal shipping routes. If it was carrying coal, the ship would have been in violation of UN resolutions passed in March last year. North Korea has been hit with a series of sanctions in the wake of its missile and nuclear program. The sanctions are designed to punish the secretive regime over its provocative missile launches and curb access to supply of coal and oil. The United States has continually demanded countries, particularly China, do more to cut off North Korea’s access to fuel and supplies which could be used to fund its weapons program. The emergence of the Hao Fan’s movements come as severe shortage of food and foreign currency grips North Korea as international sanctions bite. Analysts have warned the sanctions are contributing to a fresh wave of North Korean “ghost ship” fishing vessels washing up in Japanese waters. Exacerbating the phenomenon is the fact that North Korea has sold fishing rights to China in a bid to raise hard currency, forcing fishermen — often sailing rickety vessels — further out towards Japan in search of a catch. Dozens of North Korean fishing vessels wash up on Japan’s coast ever year, but last month Japanese coastguards registered 28 cases, the highest monthly number since records began in 2014. There has been a record number of North Korean fishermen rescued alive — 42 this year compared to none in 2016 — but there are still cases of “ghost ships” packed full of bodies, with 18 corpses recovered so far this year.